My initial reaction when I picked up the box was that it is LIGHT! I was worried because, in my experience, this level of lightness in a PC case has almost always meant flimsy construction, easily bent or warped support structure and panels that never lined up quite right once you removed them the first time. I’m happy to report I was pleasantly surprised once I got the case out of the fantastically solid packaging. 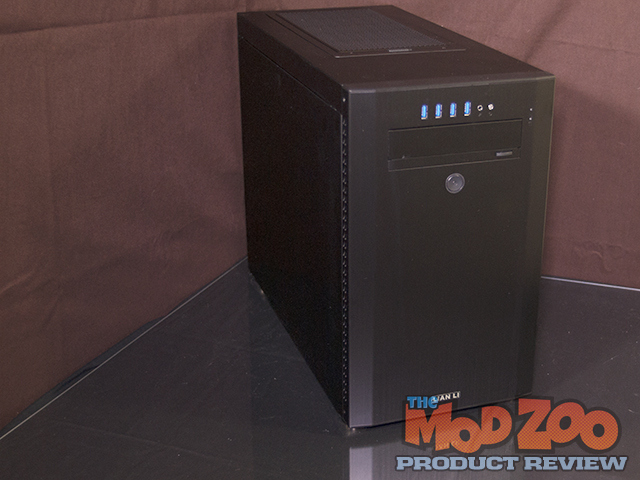 As you can see, the PC-A51B is a standard slick looking slightly shorter than standard mid-tower design. On the front are four(4) USB 3.0 ports at the top with headphone and microphone jacks sit above the included 5.25 inch CD bay cover. To the side of the CD bay are the power and HDD activity LEDs and below is the power button. Interestingly, there is no reset button. From the right side, the vents in the front bezel are included to promote the exhaust of the air being drawn from the rear and bottom of the case. The brushed aluminum black is a fantastic look that should fit in with any decor. The left side is more of the same. One thing to notice is the feet. They are machined aluminum that look like a single slice of MNPCTech’s ‘Grooved Case Feet’ (http://mnpctech.com/pc-computer-stereo-desktop-case-feet/grooved-pc-computer-stereo-rack-server-case-feet/grooved-case-feet.html) and can be easily removed and replaced with any of the custom feet available from MNPCTech. At the rear, we see the first of the major changes. First you will notice the absolute lack of a PSU mounting plate. The rear 120mm fan sits just below two pre drilled and grommeted holes for routing of hoses that would allow you to mount a 120mm radiator to the outside of the case using the existing mounting holes. The standard power plug in the lower left is a lead that connects to the PSU at the front of the case. Also, please note the lack of removable fan filter. The lack of a filter becomes more conspicuous when you investigate the rest of the case.